Parents considering private school for their children have an overwhelming number of choices. According to the National Center for Education Statistics, there are over 34,500 private schools in the USA. Some major metropolitan areas have well over 1,000! These schools belong to dozens of different associations, religious and nonreligious. Each association has its own feel or flavor, and the schools within them do, too. Here’s a comprehensive guide to the world of private schools. Parents new to this world and parents looking to make a change can benefit from this overview. This guide is divided into two parts. The first half outlines the major differences between private and public schooling. The second half helps parents who are pursuing private education for their children narrow the list from hundreds down to just a few top-priority schools. What Makes a Private School Different? Private schools themselves vary widely, of course, in terms of offerings, quality, culture, and cost. But there are some general areas where private schools differ from public, including selectiveness, accountability, independence, and funding. Public schools are required by law to service nearly all students. Private schools and charter schools aren’t. To enroll their children in a private school, parents must complete an application. And not all families who apply are accepted. Some fail to meet the criteria a given school is looking for. Private schools consider these applications for a varying range of criteria. Most will evaluate a student’s track record and scholastic achievements. Religious schools may look at church affiliation or ask for a beliefs statement. Elite private schools may also ask about extracurriculars or community involvement. The bottom line: private schools can be selective in which students they accept. The most prestigious or elite the school, the more selective they will be. Parents generally consider this selectiveness a good thing. They want their children learning alongside motivated, bright, high-achieving peers. There’s another important aspect of selectiveness that bears mentioning. Private schools generally are not required to support special needs students, but public schools are. Parents whose children have been diagnosed with a learning disability should consider mentioning this in the application process. Placing a child into a program that is not equipped to meet his or her needs is unwise, no matter how prestigious the school is. Private schools are not accountable to the state for educational outcomes. This may sound shocking, but it’s true. Instead, private schools are accountable to the students’ parents (and in some cases a governing board). This puts the burden on parents to know what’s being taught and to speak up if they are unhappy with some aspect of the curriculum. Private schools and their tuition-paying parents alike view the lack of state accountability as a positive thing. Schools aren’t shackled by bureaucracy, and educators have freedom to use the teaching styles they believe in. At the same time, most parents aren’t experts in education. They would be uneasy about paying for schooling with no oversight or certification. They want some validation that a school’s offerings are high-quality. For this reason many private schools seek out accreditation to validate that their curriculum is up to standard. Teachers and administrators in public schools have little say over the curriculum. Decisions are made at the state and district levels in accordance with state education standards. But private schools retain educational independence. They aren’t bound to state or district standards or curricula. Teachers usually have a say in which textbooks the school chooses. Further, teachers have a great deal of freedom in how they teach, as long as they get the outcomes that parents (and usually accrediting bodies) want. Private school teachers are often not legally required to be state certified, though many schools require it anyway. To view this positively, schools are free to hire subject-area experts or teachers with industry experience. Teachers are free from the constraints that come with licensure. But to view it negatively, having uncertified teachers could lower quality of education. The difference in funding mechanisms between public and private education has far reaching consequences. Public schools never charge tuition to parents. Instead, public schools are funded by a mishmash of state and local taxes. Sometimes Title grants are thrown into the mix. According to NPR, schools receive on average 45% of funding from the state, 45% from local taxes, and 10% from the federal government. 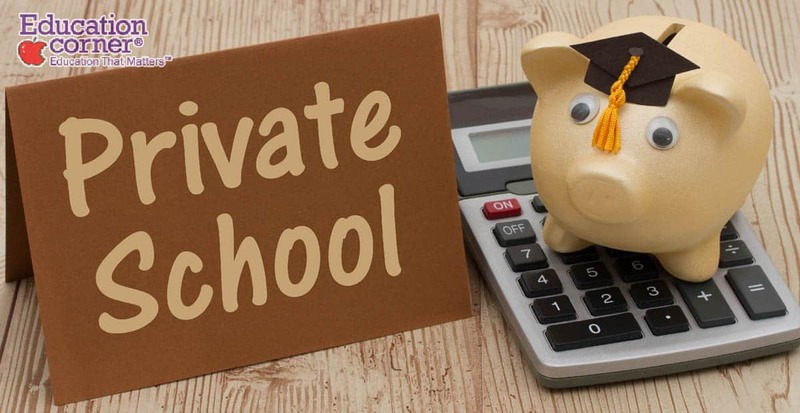 Private schools receive little or no money from local, state, or federal government. Instead, they are donor- and parent-funded, for the most part. GreatSchools mentions tuition, grants, and fundraisers as the three main sources of income. Religious schools may also receive funds from a denomination or parent organization. Lastly, some states, such as Georgia, offer education assistance (or “school choice” or “voucher”) programs that can fund private school tuition for students meeting certain requirements. Knowing the major differences between public school and private school is just the start. It’s one thing for parents to decide to pursue private school for their children. But choosing the right one is another story. This is true in part because there are just so many private schools. GreatSchools lists a mind-boggling 1,230 private schools in the Chicagoland area! Not every city reaches those numbers, but cities of any size will have numerous choices. The choice of school is highly personal for most families. No guide can by itself lead individuals to their perfect school. Instead, parents should use the criteria listed here to narrow your list to a top 3 or a top 5. From there, it’s up to the parents to decide what’s best for their families. Private schools cost money. Some cost a little, and some cost a lot. According to TheStreet, the average Catholic high school tuition is over $9000. The average non-sectarian school is over $28,000. And Forman, in Litchfield, Connecticut, is the country’s most expensive. It runs an eye-popping $62,000 per year. Before getting too far into the process, parents need to take a hard look at the family budget. How much money is available per child? Are there any expenses the family is willing to give up to pursue private education? What are the quality schools in their city that are realistic choices for their budget? Many families can’t approach the averages listed above and need to look for schools with tuition rates below the average. Parents and students alike can look for scholarships available to them. Merit- or achievement-based scholarships are more common at the college level, but some do exist for high-school students. Some schools, like Gaston Day School outside Charlotte, NC, offer indexed tuition that scales according to need. The most prestigious private day schools have their own endowments and take on a certain number of scholarship students. In short: if money is the only obstacle, it doesn’t hurt to ask a school about scholarship opportunities. School choice voucher programs are available to some parents in 14 states, plus the District of Columbia. The Education Commission of the States offers a helpful guide. There are several different categories of programs, and eligibility varies in each one. Low- and middle-income parents interested in private school should certainly check into any voucher-style programs offered in their states. Parents who choose private school must decide whether they want their children to attend a religious school. This is not a hard decision for parents that are religious, of course. And for those parents, the denomination or affiliation of the school is often important enough to trump some most factors. But what about parents who aren’t religious? The Council for American Private Education states that 10% of the nation’s students attend private schools, and 78% of those students attend a religious school. Some nonreligious or nominally religious parents still choose religious education for the values or character they perceive it to instill. It’s also important to realize that the spectrum of religious education is wide. Some evangelical religious schools deeply embed their faith into their curriculum. Others offer a basically secular curriculum taught by Christian teachers. They may sprinkle a chapel or two in every few weeks. Jewish schools and Catholic schools feel very different from each other and from evangelical schools. The vast majority of private schools don’t offer bus service. This makes location is a major factor in parents’ decision-making process. If a school isn’t reasonably close to home or work, it probably can’t stay on the list. Chicago may have over a thousand private schools, but most families can only seriously consider the ones reasonably close to home. This cuts most families’ lists down from 1200 to a couple dozen schools, at most. Class size, or student-to-teacher ratio, can be a measure of quality. It’s an indirect measure of how much attention individual students are likely to receive. Conventional wisdom says that smaller class sizes are better: the fewer students a teacher has, the more attention he or she can give each one. Prestigious schools typically boast a low student-to-teacher ratio. In the public school realm, class size is inversely proportional to funding: more funding means smaller classes, and less means larger. In general, parents tend to prioritize schools with smaller class sizes. Note, however, that Catholic schools tend to have larger-than-average class sizes. Parents looking specifically for Catholic instruction should compare class size with other nearby Catholic schools, not with nonsectarian schools. Private schools come in all sizes. Parents seeking a particular feel (large school vs. small school) should note enrollment numbers along with class size. Schools with larger student bodies tend to have the resources to offer more electives and extracurriculars. Schools with smaller enrollment may be better engaged with parents. They may offer other less tangible benefits, too, like the feeling of a close-knit community. When asking about enrollment numbers, parents should also ask for historical data. Small class size is great, but not if it’s only been achieved by a steady (or drastic) drop in enrollment. This is instead likely an indication that the school is not healthy. Because private schools aren’t required to meet state standards, hire certified teachers, or follow a district- or state-mandated curriculum, accreditation serves a vital function. While public schools are usually accredited, this is done by a state board or a regional agency (or both). And it usually boils down to whether the school follow the district’s directions and how well students do in testing. A private school’s accreditation serves as the primary external seal of approval that a school is meeting its stated objectives. This is due to the independence and difference in accountability discussed earlier. The process tends to be more thorough, because the scope of what’s reviewed is much wider. There are dozens of accrediting agencies serving the private school community. Some are national, others are regional, and others are statewide organizations. The CAPE Network provides a list. These agencies vary in their criteria, and it’s beyond the scope of this article to choose the “best” ones. Private schools aren’t required to achieve accreditation, and there are certainly some quality schools out there that eschew the accreditation process in favor of greater independence. But the Florida Department of Education warns that many accredited colleges and universities require that their students graduate from an accredited high school. Parents considering an unaccredited private school for their children must evaluate whether doing so will harm the child’s college prospects. The private school lacrosse or field hockey team may be a TV trope, but it’s one based in reality. Private schools often offer a wide range of extracurricular activities, some of which parents won’t find at the local public high school. These extracurriculars may include less common sports like lacrosse or field hockey, a foreign-language immersion program, courses in Latin or religious studies, or a more robust approach to arts education. There are a few important caveats, though. First, not every private school will have the same offerings or focus. Parents need to look for a school with programs and emphases that align with their children’s interests and abilities. Second, there is at least one consequence to private schools offering “exclusive” extracurriculars. Some sports or programs that are available at public schools (such as football, culinary, or vocational training) are often absent from private schools’ offerings. The concept of private school brings to many people’s minds an image of snobby, uniformed rich kids attending school in a stately (but very old) building. Here too TV tropes are somewhat to blame. But it’s true that private schools each have their own culture. Some may very well fit the stereotype. Others have a positive, nurturing culture. Others are known for a culture of rigor and excellence, for their focus on science and technology, or for their immersive arts focus. Parents know what kind of culture they want for their children and what kind of environment their children will succeed best in. Parents should evaluate a school’s culture through campus visits and through talking with teachers and with parents of current students. In doing so they can get a sense whether a prospective schools’ culture is a good fit for their children. Everything discussed up until now is important, but the real proof of a private school’s quality is in student outcomes. What is the college acceptance rate of graduates? And before that, what is the graduation rate of high-school students? Which colleges and universities have graduates been accepted into? Parents who have Ivy League dreams for their children really must select a private school with a track record of producing graduates who have been accepted into Ivy League schools. Strong private schools will readily produce information on student outcomes. Many will place such information on their website. Beware a school that is unwilling or unable to share such information. Finding the perfect school is tough. It’s going to take some time. But it’s much easier for parents who have a clear, specific picture of what they’re looking for. No guide to private schools can name with certainty the right school for every family. But by considering the points raised in this guide, today’s families can determine what specifically they want in a private school. They can begin searching with specificity and clarity, and they can make their final choice with confidence.